Hi trick lover, today in this article i will tell you an step by step guide on “How To Increase RAM In Your Android Phone“, so let’s read the article. Is your android phone getting slow? do you want to speed up by adding more RAM into it? if yes then you came at right place. I will tell you a detailed method for increasing android phone’s RAM, so you can easily increase your android phone’s RAM without any difficulty. I know It looks very awkward, when your phone getting slow down and start hanging while doing multi tasking or while playing a game or application. Your phone mainly start hanging and showing bugs (while using apps), when it has not enough Random Access Memory to carry out the task in background. Some users start clearing RAM or clearing background process to speed up their phone, but it does not bypass the hanging problem completely. So in this article we are going to provide you a complete hanging solution for your android phone, which will help your phone to stay active while multi tasking or playing high end games. So let’s have a look on this cool trick of how to increase ram in your android Device RAM. I will describe two detailed steps for Increase RAM in your android phone, so read the article thoroughly to completely understand both the methods. The methods have some requirements before getting started, so first of all let’s have a look on requirements for increasing your android phone RAM. Rooted Smart phone/Tablet ( Learn How to Root Android). An SD Card of atleast 8GB capacity with class 6 or higher for better performance. 1. First of all you will need to download MiniTool Partition in your PC/Laptop from here. 2. Now Open MiniTool partition software and connect your SD card using card reader. 3. Now on main screen of the software you will see your SD card in the list, select your SD card by right click and click on delete option. 4. Now it will format your SD card completely. 5. When your SD card format successfully, now you will have enough memory to make a partition in your SD card. 6. Now Select your SD card and click on “make” option, a pop up will open on your screen giving you the option for making partition in your SD card. 7. Select the partition as “Primary” and select “file system” as FAT 32 for Sd card more than 4GB or FAT for SD card less than 4 GB. 8. Leave atleast 1GB for another partition which you will use to save your backup data( its your choice that how much memory you want to use as RAM and how much you want to use as SD card memory). 9. Now click on done, then click on unallocated space(which you leave) and click again on “make” option, select primary partition but just change the file system as ext2, etx3 etc. 10. Now after successfully creating partition, close the application and remove SD card from card reader. Now you will have to make RAM of your partition SD card, let’s convert it to your phone’s RAM. 1. Now download and install the link2sd application in your android device. 2. Now open the application and here on first launch it will require the Root permission. 3. Give the permission and now it will ask you for the file system .ext partition, just select the partition you have created while partitioning. 4. Now sort the apps application and start linking them to your created partition. 5. That’s it now all those application will use the RAM you have created and your phone will never hang again. 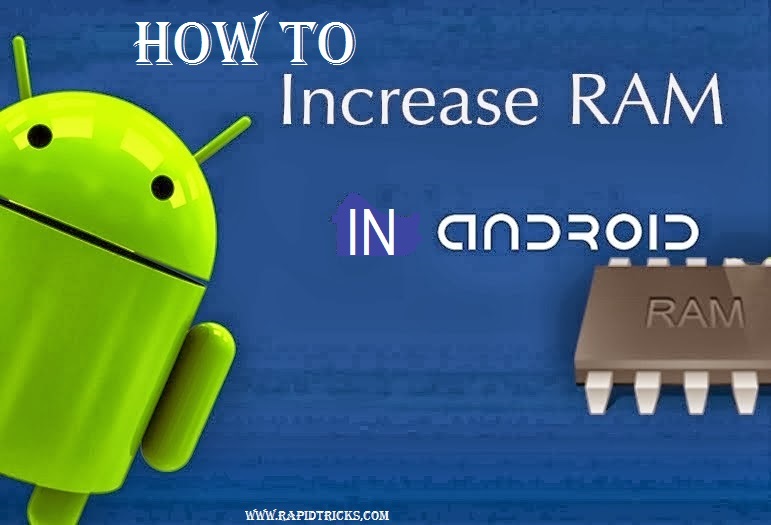 So above we have told you the detailed article on “How To Increase RAM In Your Android Phone“, by using the steps given above you can easily increase RAM of your phone. If you like the article than don’t forget to share it on social media and tell everyone how they can increase RAM in android phone. Stay connected with us on social media and get regular updates on latest tips and tricks, you can like our Facebook page or any other social media page from the sidebar. If you have any query related to the article then feel free to tell us in comment box, we are here to help you.